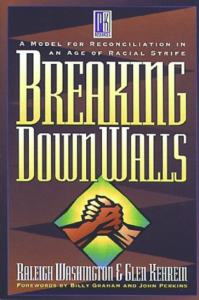 The following two books are reviewed as part of an ongoing study of the “Racial Reconciliation” phenomenon typified by the growing number of new books and public speakers. My comments on these two books do not necessarily reflect my conclusion on the whole movement. I have been reminded so far of many unnecessary insensitivities that occur within the family of God because of race, but I have been unimpressed by the hermeneutic that jumps from the biblical mandate to reconcile sinners to God, to a social mandate to reconcile sinners to sinners. Raleigh Washington, a black man, and Glen Kehrein, a white man, minister together at Rock Church and Circle Urban Ministries in Chicago. Their plea for racial tolerance within the body of Christ is needed. It is wrong of us to send missionaries to people who would not be welcome in our own church. But that is often overshadowed in this book by a plea for social action in difficult places like Chicago or South Central L.A. To the authors, the “ministry of reconciliation” can be applied to anything that is broken in God’s creation. They write, “Likewise, every Christian has the responsibility to be a reconciler. [They quote 2 Cor 5:17-18.] As Christians we have a biblical mandate to be ambassadors of reconciliation in the name of Christ wherever we encounter brokenness. The purpose of this book has been to focus especially on an area of brokenness that has been grossly neglected by Christians: racial separation and alienation, even [mine] within the body of Christ” (210). If I am not mistaken, this has been the social gospel hermeneutic for years. The gospel becomes a righting of any wrong. Regeneration is one of many equal reconciling tasks. Boone is a well known Promise Keepers speaker and has his own campus outreach ministry. The emphasis is the same as before: jumping from the spiritual to the social. Boone adds a heavy charismatic influence to his approach, receiving the second blessing when the Shekhinah glory entered his bedroom (187). Interestingly, he connects the racial reconciliation movement to the Azusa Street revival of 1906 and resultant Pentecostal movements. Boone writes, “Whites, as they look out in repentance [?] may identify with the sins of the forefathers as Jesus identified with Adam’s transgression (69).” He seems to suggest that Christ’s ability to atone for sin was simply in his ability to identify with the race. This, then, becomes our ministry as well.